The science behind these crease patterns is in Falck, Neyrinck & Szalay (2012), Neyrinck (2012) and (a bit more pedagogically) Neyrinck & Shandarin (2012). 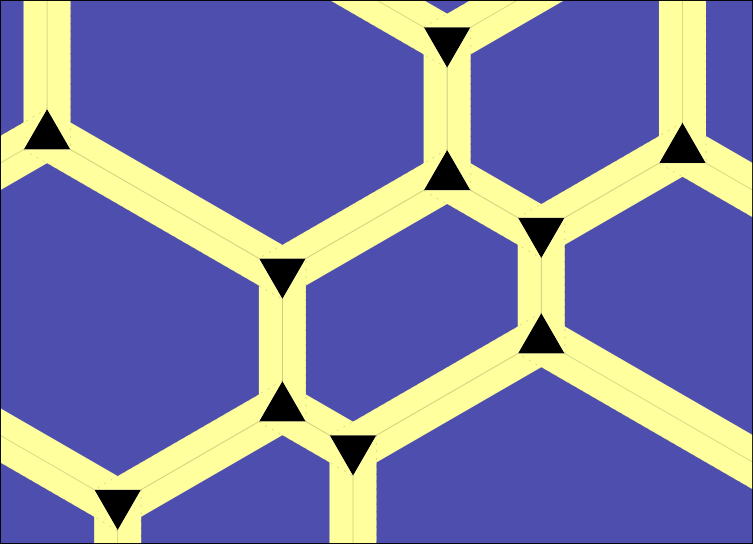 The patterns, produced by Mark Neyrinck, are essentially tessellation elements from Eric Gjerde's "Tiled Hexagons" pattern, in his Origami Tessellations book. 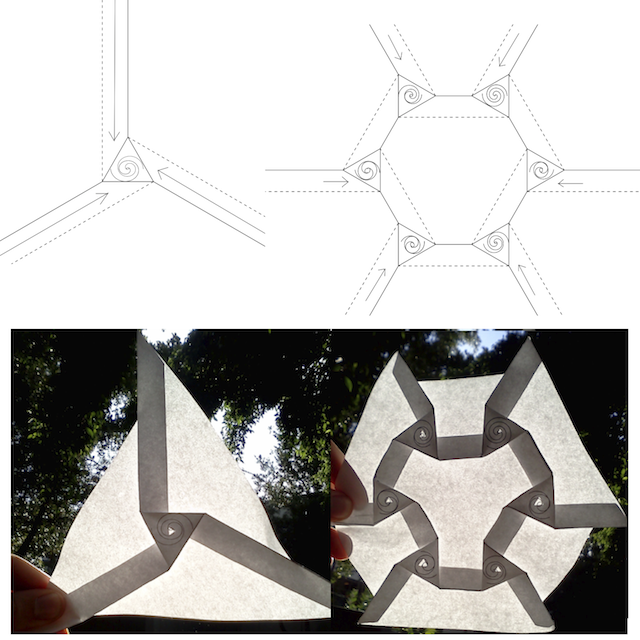 See his Origami Tessellations website, as well. To download .pdf files of the below patterns, click on the pictures. Solid lines call for "mountain" folds, pointing upward; dashed lines for "valley" folds, pointing downward. 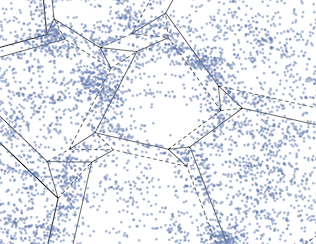 Arrows show the direction of schematic matter flows after the galaxy has folded up. The triangular and hexagonal outer paper-edges in the photograph require some cutting. These works are licensed under a Creative Commons BY-NC-SA 3.0 Unported License. Trivia: On June 5, 2012, Venus passed in front of the Sun as this photo was taken, Venus' atmosphere undetectably reddening the result. 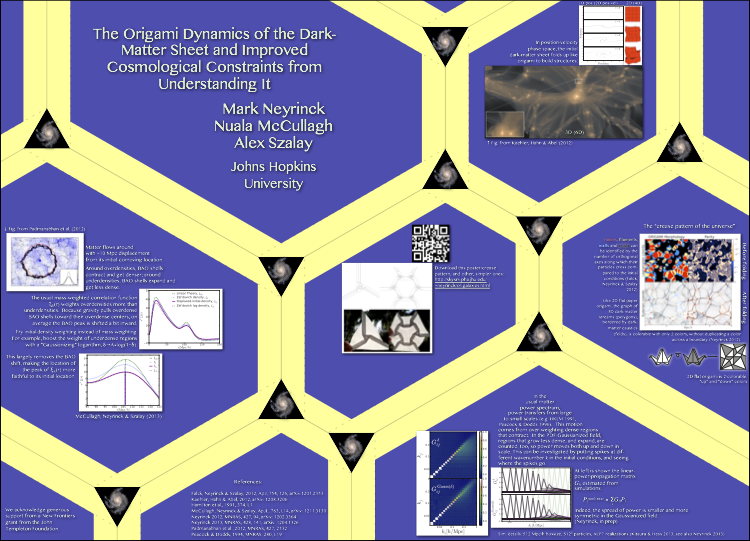 Links: Mark's homepage, The JHU Physics & Astronomy Dept homepage.